Plants survive because of the sun and animals owe their survival to plants. Plants upon which humans and animals depend for life are susceptible to 80,000 to 100,000 diseases caused by viruses, bacteria, mycoplasma like organisms, rickettsias, fungi, algae and parasitic higher plants. Approximately 3000 species of nematodes attack plants and more than 1000 cause serious economic plant damage. Of the one million species of known insects, about 10,000 contribute to devastating crop losses worldwide. Pests are organisms that are competitive to mankind or its interests in some manner. Pesticides are agents employed by humans to destroy and control pests. The term “pesticide” includes insecticides, herbicides, fungicides and other types of pest controlling substances. Worldwide, about 3 billion kgs of pesticides are applied to crops each year at a cost of almost $40 billion. Of this amount, approximately 500 million kgs of more than 600 different pesticides are being applied in the U.S. alone at a cost of $10 billion. Paradoxically, despite the vast increase in the volume of toxic pesticides used over the past 30-40 years globally to control crop diseases, the amount of crop losses due to pests has increased from 31% to 37%. Shockingly, despite a 10-fold increase in pesticide usage in the U.S. from 1945-2000, crop losses from insect damage have doubled from 7% to 13%. (Pimental, Pan-UK 2003). This ever increasing use of toxic petrochemical based pesticides is taking its toll on personnel as well as the environment. The EPA estimates 300,000 farmers and workers were poisoned last year in the U.S. Worldwide, pesticides cause 26 million reported cases of non-fatal poisoning each year (Richter, 2002) of which 3 million require hospitalization, 750,000 come down with chronic illnesses and 220,000 are fatally afflicted. (Hart and Pimental, 2002). The unreported case numbers are believed to be much higher. Around the globe, scientists are searching frantically for alternative methods of pest control, as the ever increasing amounts of toxic chemicals that seep into our soil, leech into our aquifers and vaporize into the atmosphere continue to wreak havoc with the environment. With the world population expected to undergo its most rapid rate of increase in history, from 6.5 to 9.0 billion by 2050, the need for new methods of control has never been greater. Nano Green believes it is in the forefront of this quest, being able to provide a continually evolving green technology that offers an environmentally sustainable alternative to farmers and growers. Altho Nano Green is basically a Plant Tonic, it has proven to be particularly effective both in eliminating soft bodied insects, as well as a host of fungal and bacterial diseases. Because it is not currently registered as a ‘cide’ or killing agent, all work done in this area has been in the nature of university or field testing. As of date, tests have been conducted and studies have been run in Australia,Brazil, Brunei, Bulgaria, Canada, China, India, Japan, Korea, Malaysia, Mexico, New Zealand, Panama, the Philippines, Russia, Slovenia, South Africa, Thailand, Turkey, Ukraine, the U.K., the U.S., Vietnam and Zambia. Tests have been successfully conducted on asparagus, bananas, bell peppers, cherries, chili peppers, coffee, corn, cucumbers, grapes, leafy vegetables, limes, macademia nuts, mangoes, melons, nectarines, onions, ornamentals, papaya, pineapple, plums, rice, strawberries, sugar cane, tea, tomatoes and wheat. Alfalfa testing is about to begin. It has also been used on a very large number of rare fruits, ranging from allspice to wax jambu. It has proved to be equally effective in its ability to combat fungal and bacterial infections as well as insect infestations. Nano Green is presently being sold in Australia, southeast Asia, the Pacific Rim, South Africa, Turkey and eastern Europe as a Plant Tonic. Because it has not yet been registered with the EPA or the various foreign regulatory agencies as a ‘cide’, or killer, it cannot yet be offered for that purpose. However, Nano Green Sciences is planning to apply for approval as an overall pesticide in several countries during the 2008 calendar year. In preparation for this, we would like to take the opportunity in this section of our web site, to share with the agricultural community the results we have obtained in scores of tests with both universities as well as growers. In short, Nano Green works at the organic molecular level, affecting the hydrocarbon composition of the pest, which is in total contrast to the traditional chemical methodology. Whereas an insect may develop a resistance to chemicals, which are designed to affect its neurological system, it cannot develop a resistance and immunity to a product that affects its respiratory functions. When scientists were further asked to explain precisely how Nano Green functions to eliminate or control predatory insects, a variety of explanations were offered. One - Fatty acids penetrate the insect's outer covering (cuticle), dissolving or disrupting cell membranes and cytoplasm. This disruption of cell integrity causes them to leak and collapse, destroying respiratory functions, which results in dehydration and death of the insect. Two - It may act as an insect growth regulator interfering with cellular metabolism and the production of growth hormones during metamorphosis. Three - Because of its carbon length, it can de-wax the pest's joints, leading to paralysis, which allows them to fall victim to other pests. Four - It strips the pest's organic shields (wax, biofilm, etc) used as a protectant, thereby rendering it defenseless against subsequent treatment. Note: Both Three and Four are somewhat similar to One. Five - It impacts the exoskeleton structure of the pest upon contact by disrupting the molecular structure of the chitin and other protein substances that protect the insect. This mechanism of action triggers the rapid and irreversible deterioration of the insect's spiracles and tracheal system, resulting in suffocation. Six - It has the ability to invade the interstices of complex hydrocarbon chains within a plant's leaves and disintegrate them. Seven - It emulsifies and separates bacteria, thereby stopping the reproductive cycle. As bacteria divide to reproduce, it's not certain how valid this argument is. Eight - Oil blends kill insects by blocking specific neural pathways, octopamine neuron-receptors. Octopamine in insects are neurotransmitters that control insect movement, behavior and metabolism. The blockage of the receptor prevents the transmission of the octopamine signals, which leads to toxicity such as excitation, hyperextension, abdomen, immobilization and death. Aphids: Tests were conducted on ornamental plants, potted plants, green peppers and cherries. The dilution ratio is 1:500 and 1:600. After three days, the mortality is 98%. Scales: One test was conducted on potted plants with results. The scales on potted plants had 98% mortality after three days of 1:600 dilution spraying. 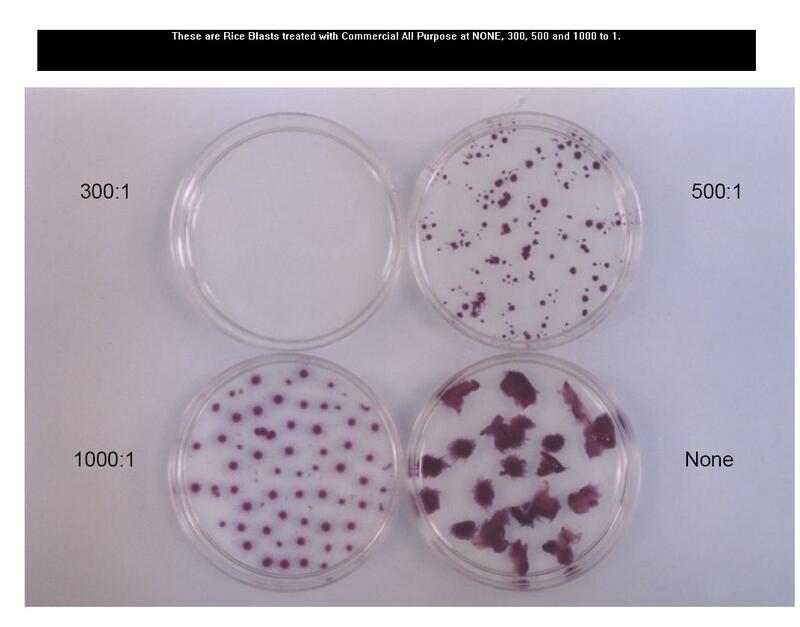 Powdery Mildew: The three dilutions were tested, 1:400, 1:500 and 1:600. Experiments were melon, tomato and ornamental plants. 98% of infected areas were cleaned at 1:400 and 1:500. And 90% of Infected areas were cleaned at 1:600 dilution. After 15 days, no new infestations were observed. In a subsequent report on cucumbers from China, where trials were conducted with no scientific or field supervision, the report read, Result is positive, the summary of the report as: efficacy faster, yield good result, safety. No negative result to beneficial living things, it’s prevent illness, control insect pest, and good growing. It has very good prevention of lepidopterous insects. The control result of downy mildew 90.3%, blight 89.97%, anthracnose 81.5%, green house whitefly 87.54%, curcurbit leaf beetle 91.2%, America fly 63.33%, aphid and moth 90.3%, output increase 9.4%. Nano Green is essentially an enhanced fatty acid. As such, it has antibacterial, antimicrobial and, most importantly, antifungicidal properties and has proven to be extremely effective in the treatment of a myriad of fungal and bacterial diseases. These petri dishes were infected with rice blast and then sprayed with a 25% Nano Green concentrate at the dilutions stated. Nano Green can not only control these and other fungal diseases, it can do so at a substantial savings to the farmer/grower, while at the same time increasing field productivity from 10% to over 25%. What Type of Plant Problems Does it Control? Does the Plant Issue its own Signals? Many agronomists and soil scientists maintain that healthy plants emit high frequency radio signals, while sickly plants emit low frequency radio signals. Insects appear to be able to hone in on these frequencies, but will invariably only attack the more susceptible and sickly plant, the one issuing the low frequency signal. This explanation has been offered in answer to the question as to why plants sprayed with Nano Green appear to be much less affected by insect infestation. The healthier the plant, the more able to resist both insect and disease. One school of thought maintains that the high sugar content in the leaves of a thriving plant are toxic to insects, because of their inability to synthesize too much sugar. In effect, the excess sugar turns into alcohol within the insect and becomes toxic to the point of being fatal, something they instinctively realize. This may help explain why plants sprayed on a consistent basis with Nano Green very rarely are afflicted with insects or the diseases spread by them. Old habits die hard. Despite the benefits that Nano Green can offer, many farmers do not feel comfortable in just disposing of the conventional chemical treatments they have been using for many years. This is not a problem. When used in conjunction with traditional pesticides and fertilizers, Nano Green improves their delivery and potency. The pesticide dissolves more easily in water, thereby simplifying application to crops. The pesticide/fertilizer becomes more stable and the killing capability of the chemical pesticide is optimized. Additionally, because of Nano Green’s power as a degreaser, it is extremely efficient in its ability to dissolve hydrocarbon build-ups and old caked-on residues from lines, nozzles and emitters. Much more economical to use, often saving the farmer 50% or more. One product replaces multiple insecticides, fungicides, bacteriacides, etc. Eliminates “damping off” in greenhouse applications.